Did you know that fatal gun mishaps have been so common in America that for centuries, newspapers carried regular columns reporting on “melancholy accidents”? 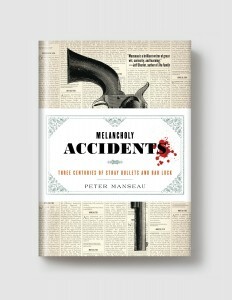 It came as a surprising discovery when, while conducting research that involved reading colonial-era newspapers, acclaimed writer Peter Manseau stumbled upon one report after another of “melancholy accidents”—instances of local people accidentally discharging firearms to disastrous results. Usually, they were brief items, with the concision of dark poetry—hunting accidents, neighbor shooting neighbor, father shooting son. Dark as they were, they were also often bizarre and fascinating—such as the case of one farmer who, trying out his new musket, shot it at his barn, hitting a door hinge that split the musket ball in two, with each half ricochetting off to hit a different, distant person, each of whom was a doctor. In Melancholy Accidents, Manseau collects and annotates a wide-ranging assortment of these woebegone and oddly intimate reports, with numerous illustrations, photos, and visuals from original period newspapers. It makes for a wholly unique contribution to the ongoing consideration of—and the recent heated discussion about—the historic place of firearms in American society. PETER MANSEAU holds a doctorate in religion from Georgetown University and is currently a fellow at the Smithsonian. He is the author of Rag and Bone, Songs for the Butcher’s Daughter, Vows, and One Nation, Under Gods. He is the winner of the National Jewish Book Award, the American Library Association’s Sophie Brody Medal for Outstanding Achievement in Jewish Literature, the Ribalow Prize for Fiction, and a 2012 National Endowment for the Arts Literature Fellowship, and he has also been shortlisted for the Center for Fiction’s First Novel Prize and the Prix Médicis étranger, awarded to the best foreign novel published in France. He is a founding editor of Killing the Buddha, and he lives in Annapolis, Maryland.